The Billionty-Oneth Geek: 90 minutes with 127 HOURS!!!!!!!!!!!!!! 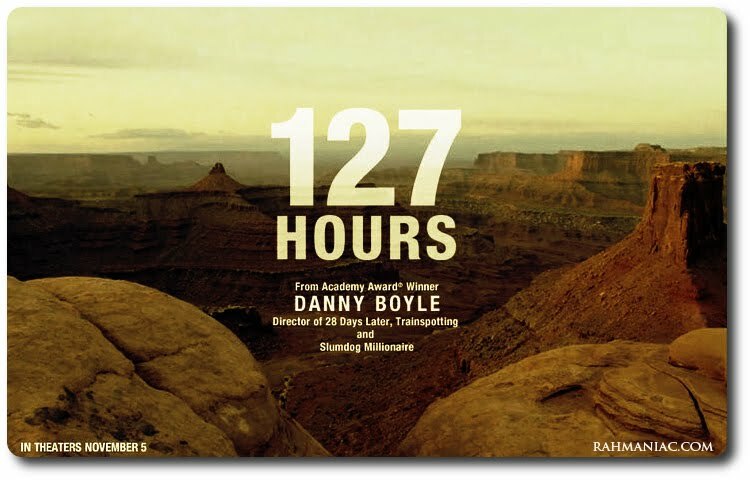 90 minutes with 127 HOURS!!!!!!!!!!!!!! 127 Hours is the third movie I've seen in the past year that deals with theme of isolation (the first being Frozen and the other being Buried). All three use a minimalist approach to film making and despite the limitations of locations, manage to tell three very different, yet unique and emotional stories. Frozen dealt more with victims battling against forces of nature, Buried focused more on the mystery aspect of a man trapped in a coffin and finally, 127 Hours was more about one's drive to overcome the self. 127 Hours is a true story about a mountaineering/canyoneer named Aron Ralston who goes out to explore the vastness of canyons offered in Utah. He's shown to us as a thrill seeker and one that wants to connect more with nature rather than a life afforded by an engineering career (his words not mine). On one particular trek, he stumbles and falls into a crevasse only to have a boulder fall and trap his right arm. That's only the first 10 minutes. The remaining 80 minutes shows us his struggle and determination to persevere and survive. It goes without saying, but Danny Boyle is a great director. Just look at his past 5 movies. He's covered horror, sci-fi and drama. And he did all of them well! It's a testament to his versatility as a director. 127 Hours turns things upside down, as he's given an opportunity to show how much he can do with so little. But much should be said of James Franco as well, who spends 95% of the movie alone on screen. Franco himself is sort of a renaissance man. He's an actor, a painter, a writer; one who always seeks to fine his craft. A few years ago, he went back to acting school to do just that. In fact, while studying at NYU, he took a recurring role on the daytime soap opera General Hospital (after the fact that he's made it big). I read a few of his stories in Esquire and he does a fine job of weaving words together. Anyhow, in 127 Hours he really pushes himself, and it's probably a side of Franco that we haven't seen yet on the big screen. We see the full spectrum of emotions on his face through the duration of the movie (well, that's all we really get to see). I really recommend that all three movies. They each have different offerings but really do what's been missing from Hollywood movies this past year: storytelling. Until next time, later geeks! Have you seen "Rear Window" by Alfred Hitchcock? I think it belongs to the category of isolation as well and good storytelling. Whole thing is filmed on from one room. We have it here next time you're free NEIGHBOUR!